“Cut all the way through!” says Philip Vargas Sensei of Aikido of Albuquerque. And down comes his bokken. Just move. Crack. Just a glancing blow that time. Eh, well that was…better, goes my internal dialog. “Ok, try that.” Vargas Sensei sends everyone back to practice and I rush back to my partner. And so went Friday night’s classes, which started the Birankai Aikido Southwest and Rocky Mountain Regional Seminar last weekend in beautiful Boulder City, Nev. Fifteen students from New Mexico made the trip to support the regional seminar, and I was excited to see so many others from within the region and outside (California) come together to train. Saturday was ushered in by Bernadette Vargas Sensei’s conditioning routine. Jumping-jacks, squats, push-ups, flutter kicks, leg lifts, crunches (abs, abs, and more abs). Then shihonage and iriminage (up and down, up and down). Lizzy Lynn Shihan of Eastshore Aikikai and Archie Champion Shihan of Central Coast Aikikai not only offered their knowledge and experience to those in attendance, but offered encouragement and inspiration as well. The range of people there was humbling: participants as young as 11 years old and others that barely in their third month of training. It was a challenge working with so many different body types and skill levels, but it reminded me of the potential of Aikido. The confidence it inspires in the 11-year-old, throwing someone twice his size. The responsibility it instills in the senior students to make sure the new students are taken care of; falling safely, guiding them through unfamiliar techniques. By Saturday evening, the soreness and fatigue was setting in for everyone. But it was nothing a little pizza and beer (for the appropriate crowd) couldn’t cure! After good food and a good night’s rest, we were ready to tackle Sunday’s classes: body arts and bokken. And in a blink of an eye, the weekend’s over. After classes, it’s a flurry of moving mats and saying goodbye to friends, promising that we’ll train together soon. I leave the seminar in high spirits; happy at how big the turnout was, grateful for the support of those who came and for those who organized the event. 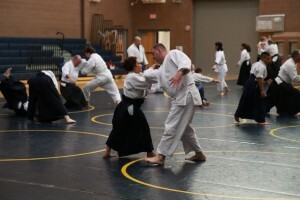 A special thanks to the Las Vegas Aikikai and Boulder City Aikido dojos for their hospitality and hard work organizing the seminar, and also to the T. K. Chiba and Mitsuko Chiba Seminar Endowment for supporting our training. Thank you to the shihan, senior teachers, and to the California contingent that came to support our region. Editor’s note: View more video of this event at the BiranOnline channel on Youtube.